Caring for furniture and wood artifacts demands an understanding of how and why wood deteriorates. This course offers a simplified explanation of the chemistry and structure of wood as well as the finished wooden object; be it either a totem pole, plow or a French polished table. Care of Furniture and Wood Artifacts teaches students to identify woods, finishes and furniture styles, write condition reports, and understand the agents of deterioration that are harmful to wood both in storage and on exhibit. Topics include preparing wood artifacts for storage and exhibit, the use of archival materials with wood artifacts, housekeeping techniques for furniture and large objects on open display, basic repairs and three dimensional supports for storage or exhibit. June 12-13, 2014, "Collections Management and Practices"
"Fluid Preservation: A Comprehensive Reference"
Special Events Security Friday, September 19, 2014, 1:00 - 5:00 p.m. Your Personal Safety, Monday, November 17, 2014, 9:00 - 10:15 a.m. Emergency Operations Planning, Monday, November 17, 2014, 10:30 - 11:45 a.m.
Security Resources for Small Museums, Marketplace of Ideas, Monday, May 18, 2014, 3:15 - 5:15 p.m. Welcome to the Collections Caretaker e-Newsletter from Northern States Conservation Center. The newsletter is designed to bring you timely and helpful content that is pertinent to situations we all encounter in our museum and archives work. Feel free to let us know what topics you would like to see featured in Collections Caretaker or even contribute an article. Photographs are among the most common objects in modern society. But think for a moment how you care for photos. Are your personal snapshots - the photographic record of your family's history - kept in acid-free portfolios stored in climate-controlled rooms? Probably not. Unfortunately, that's often the case with photographs held by museums, archives, and libraries, too. But before delving into how photographs should be stored, we must begin with photographic technology. Anyone who is responsible for photographic collections should know what photographs are; how to identify specific processes and the materials used to construct prints. This foundation provides a broader, deeper understanding of how photographs age, how to combat aging, and the principles behind environmental and handling guidelines for photograph collections. We will start this course discussing photographic technology from the 19th and early 20th centuries. A photograph is not an image. Rather, it's an object that contains an image. It has layers of materials. We can speak generically about the structure of photographs using these terms: support, binder and final image material. Although the structure can be more complex, these three are a good place to start. Understanding the various layers in a completed photograph and how they relate to each other is vital to caring for photographs. A cross-section helps understand these layered structures. We will refer to it often, both in diagram and occasionally in photomicrographs of prints. In the PowerPoint lecture, cross-sections will always be displayed with the image layer on top and the support below. Just as every house needs a foundation, every photograph must have a base. What we'll refer to as the support layer provides that base. As other layers are attached, it provides rigidity, flexibility and strength for every photograph. The support layer also can add optical properties such as transparency or reflectivity. Numerous support materials have appeared and disappeared - sometimes only to return - throughout the history of photography. The most common are paper, glass and plastic. Each has physical or optical advantages and disadvantages, and each displays certain types of deterioration. Paper, for instance, has been used since the beginning, first as a support for negatives and prints by William Henry Fox Talbot and later as a support for albumen prints from 1855-85. Paper again turned up as a support for gelatin silver prints and chromogenic color prints until 1970. It also has been used for a variety of other processes, including platinotypes, cyanotypes, matte collodion prints and others we'll examine throughout this course. Metal served as a support for the daguerreotype from 1840-1855, and then again for the tintype (despite the name, tintypes relied on iron) from 1856-1920s. Glass was used for wet plate collodion negatives (1851-1880), ambrotypes (1855-1860), and gelatin dry plates (1880-1925). Plastic, which includes cellulose nitrate, cellulose acetate and polyester, has been used since 1889 for black and white negatives and since the 1930s for color film. It was used for some color prints in the 1940s and '50s. A variant of the solid plastic support was resin-coated or RC paper, which was introduced in 1968 for color and black & white printing papers. The RC support consists of a sheet of paper sandwiched between two thin layers of polyethylene. Leather, cloth, and ceramic have also been used, but they were not commercially important. The binder holds the final imaging substance to the support. Though it's sometimes called an emulsion, that term refers solely to gelatin-based binders during manufacture. We will use the term binder or image layer and, as we will see, not all photographs have binders. While a number of binders have been used, gelatin, albumen and collodion are the most common. Gelatin does not occur naturally; it's derived from collagen extracted from the bones, skin and hides of cattle. Gelatin has many qualities that make it an ideal photographic binder: it's tough, resists abrasions when dry, and swells in water, allowing processing chemicals to penetrate. Not surprisingly, gelatin has been the dominant photographic binder since the 1880s. Albumen - egg whites - and collodion - cellulose nitrate dissolved in alcohol and ether - preceded gelatin. The final layer forms the image after exposure and processing - when the photograph is completed. It is often held in a binder. Though silver has been among the most common materials used for what we'll call the final image material, it is not the only option. So why do we call it the final image material? Why not just image material? Well, because the light sensitive substance in the photograph before processing is often dramatically different from the final image material. For example, a chromogenic color print starts out with a silver-based light-sensitive imaging material, but the final print contains only color dyes. The silver is removed during processing. Platinum prints start out as iron and platinum salts, but finish with only platinum. Likewise, cyanotypes begin as two iron salts and finish as one (blue) iron complex. Carbon prints begin as a layer of gelatin with pigment and finish that way. Finally, gelatin silver prints (also known as black and white prints) start as silver halide crystals and finish as metallic silver. Each final image material has a particular weakness. This helps determine the best way to care for a particular photograph. As we delve deeper into each type of photograph we will discuss how its construction affects its permanence, or, conversely, causes its deterioration. Excerpt from MS222 Care of Photographs starting June 23, 2014 with instructor Gawain Weaver. Gawain Weaver teaches international workshops on photograph conservation and preservation. He earned his master's degree in art history and conservation from New York University's Institute of Fine Arts and was a fellow at the George Eastman House and Image Permanence Institute for two years. His interest in photograph conservation included studying at Library and Archives Canada, the Amon Carter Museum, the Museum of Modern Art, and the Northeast Document Conservation Center. For more information visit his web site Gawain Weaver Art Conservation. At their heart, regardless of type or size, museums are educational organizations. This course is about how we can facilitate visitors' meaningful and memorable experiences in the informal environments of museums. Required text: Anna Johnson, Kimberly A. Huber, Nancy Cutler, Melissa Bingmann and Tim Grove. The Museum Educator's Manual: Educators Share Successful Techniques. Lanham, MD: AltaMira Press, 2009 (Paperback ISBN 13: 978-0-7591-1167-7) (About $27.00). Faculty: Stacia Kuceyeski is CEO of The Creative Learning Factory at the Ohio Historical Society. Stacia wants to provide participants with an experience that is engaging, informative and, most of all, directly applicable to their professional lives. Stacia provides high quality professional development for cultural heritage professionals as well as a K-16 audience in a variety of humanities content areas and learning theories. She has presented and published for a number of organizations including the American Association of State and Local History, the Midwest Archives Conference and the Teaching American History Project Directors' Conference. When not making professional development magic happen, Stacia enjoys the Golden Girls, sassy earrings and an unnatural affection for our 27th president, William Howard Taft. Stacia earned her B.A. in History and her M.A. in Cultural Policy and Arts Administration, both from The Ohio State University. This course proposes that museum administration and leadership matter, regardless the size or focus of your organization. Topics include governance and administrative structure, nonprofit status, mission and vision, board and staff responsibilities, the relationship between board and staff, strategic planning, human resource management, and leadership. As part of the Small Museum Pro! Certificate Program, this course is designed for small museums and their staff, including staff members who may or may not be paid or who, in fact, may be a board member who also serves as curator or in some other capacity in the museum. Even if you work mostly with collections or programs, you will benefit from an understanding of the administrative side of the museum, and will benefit from exploring your own leadership approach. In addition to weekly reading and assignments, participants will have the opportunity to create a Board Member Orientation Packet/Handbook for board member training at your organization or prepare a written reflection on what constitutes effective museum leadership. Thomas Wolf. Managing a Nonprofit Organization: Updated Twenty-First Century Edition. New York: Free Press, Simon and Schuster Inc., 2012. (Paperback ISBN-13: 1451608465). Cost about $15.00. Hugh H. Genoways and Lynne M. Ireland.Museum Administration: An Introduction.American Association for State and Local History.Walnut Creek, CA: AltaMira Press, 2003. (Paperback ISBN: 0-7591-0294-5). Cost: $36.00. Optional text: Stephen E. Weil.Making Museums Matter. Washington DC: Smithsonian Institution Press, 2002. (Paperback ISBN: 1-58834-000-7). Cost: $19.00. Faculty: Anne W. Ackerson began her consulting practice in 1997 following a successful career as director of several historic house museums and historical societies in Central and Eastern New York State. Anne works with a wide variety of cultural organizations ranging from museums to arts councils to orchestras and community theatres. Among the range of projects with which she has been involved include building a board recruitment process, assisting with executive search, evaluating membership and fundraising programs, stakeholder assessment, strategic planning and meeting facilitation. She is a frequent workshop presenter and author, focusing on issues of board and organizational development, governance issues, and planning. She writes regularly about management and leadership issues for cultural institutions in her blog, Leading by Design (http://leadingbydesign.blogspot.com). Photographic materials cover a diverse range, everything from the daguerreotypes and wet plate negatives of the 19th century to the gelatin silver, chromogenic and inkjet prints of the 20th and now 21st century. Care of Photographs offers a broad introduction to the history, technology, identification, and care of these and other photographic materials. Topics include environmental monitoring, the effects of temperature and relative humidity, and the importance of cold storage for certain photographic materials. 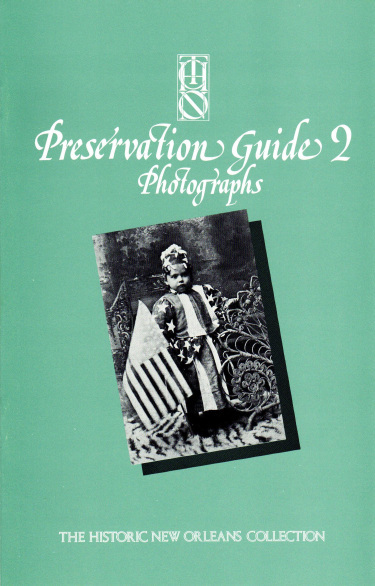 It is intended to help those caring for photographic materials to gain a better understanding of their collections and how to care for them. Each student will need to purchase a sample set of photographs at a discounted rate of $75. You can order them from the instructor's web site http://gawainweaver.com/store/#sample, select the "Cost with Workshop" set. The sample set 18 photographic and photomechanical processes. Processes included: albumen, collodion POP, gelatin POP, matte collodion, gelatin silver print FB, gelatin silver print RC, letterpress halftone, offset lithography, rotogravure monochrome, rotogravure color, collotype, chromogenic color RC, chromogenic color FB, inkjet dye-based, inkjet pigment-based, dye sublimation, electrophotographic, photogravure. If you would like to submit an article, notice of an organizational meeting or upcoming workshop for an upcoming Collections Caretaker Newsletter, send your submission to peggy@collectioncare.org. We are always looking for contributions to this newsletter. Submission deadline is the 10th of each month.